Block-outs in this market ﬂoor were seeded with transparent, round and polished jelly bean glass and exposed through washing to maintain aggregate clarity and a river-pebble proﬁle. The recycled glass aggregate in the concrete not only adds to the LEED points, it also complements - and literally mirrors - the structure's design. The studio ﬂoor at the Benicia, Calif., ofﬁce of The Concretist was seeded with broken post-industrial glass and bits of scrap steel, then diamond-ground for better exposure and sealed with a solvent-based acrylic. 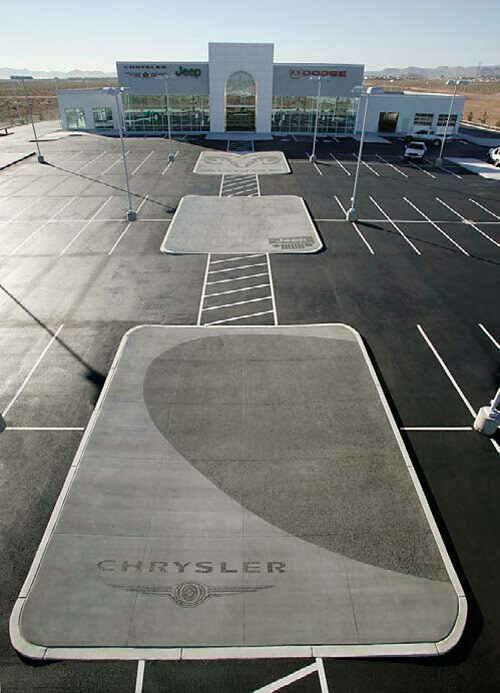 Black glass was seeded into freshly poured concrete pads at a Las Vegas auto dealership. Glass aggregate is typically graded by size, and sizes can range from sand-like powder to fist-sized chunks. Using finely ground clear glass in place of sand can make for purer colors of the matrix. Finely ground glass also lends itself nicely to highly polished finishes. Putting a high polish on concrete loaded with finely ground, earth-toned glass aggregate can create marble or granite effects. 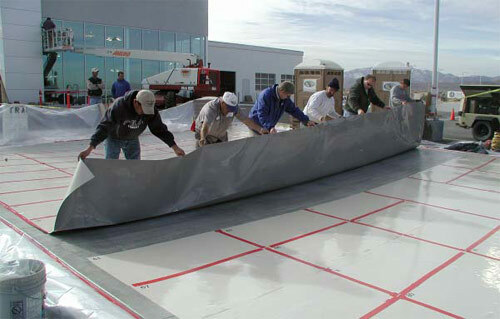 Adhesive stencils are laid in rows. "Cause that's what the guys were drinking," he says. Cullet tends to be flatter and less translucent than the specialty glasses, which typically have fuller, more irregular shapes, like crushed gravel. The purer colors and clarity of specialty glasses appeal strongly to many artisans. But others prefer cullet because its flatness means it takes less grinding to expose. 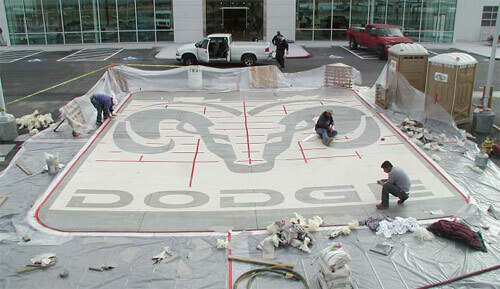 After the stencil has been adhered, computer-rendered precut material was removed, revealing the ﬁnal design of the Dodge logo. Panel seams and exposed edges are being covered for sandblasting, which will expose black glass aggregate in the gray concrete. Glen Roman sandblasts a portion of the Chrysler logo at the dealership. Completed concrete pads represent vehicle makes sold. 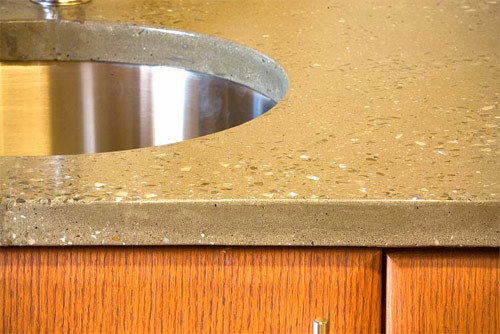 "I am not an environmentalist," says Mark Celebuski, general manager of Pinnacle Cast Concrete in Brownstown, Penn., who helped CeraTech adapt Eccorok for countertops. "But if I can make things people want to buy and they're green, I'd rather do that."